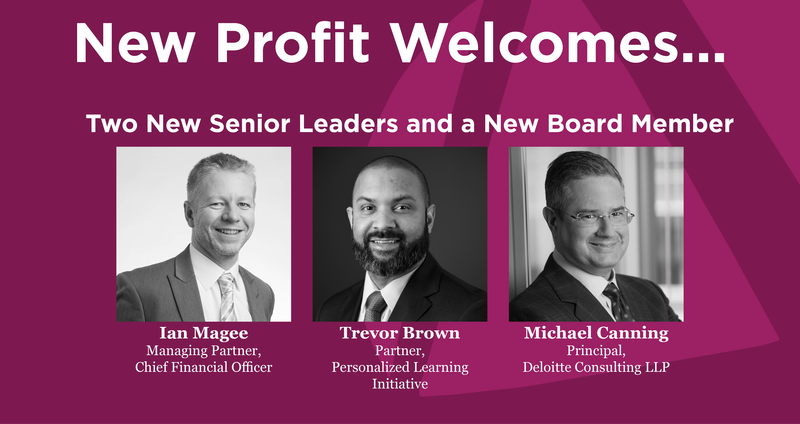 December 15, 2016 (Boston): New Profit, a pioneering venture philanthropy organization working to break down barriers to opportunity in America, is excited to announce three great additions to our community: Michael Canning, Ian Magee, and Trevor Brown. Michael Canning, a principal with Deloitte Consulting LLP, has joined our board. Canning has spent 26 years with Deloitte, starting with the organization as a research analyst in 1988. As a Life Sciences and Healthcare (LSHC) principal, he has focused on strategy and business transformation engagements with some of the organization’s largest and most influential clients, while also becoming a published thought leader on trends in the healthcare industry. He also serves as the US Consulting Strategy and Transformation Leader and sits on the US Consulting Executive Committee. An accomplished musician, Canning is on the Board of the Boston Celebrity Series, a performance arts organization. He also served as Chairman of the Board of MAPS Worldwide, a multi-service, non-profit child adoption organization, from 2008-2013. He and his wife of 24 years, Adrianne, have three adopted children from China. Ian Magee has joined New Profit’s leadership team as Managing Partner, Chief Financial Officer with responsibility for overseeing all of the organization’s financial strategy and planning, accounting, and compliance activities. He was most recently Vice President of Finance and Operations at The FB Heron Foundation, which has been a leader in the impact investing movement, among other things. Previously, Ian worked at the University of Chicago as Executive Director of Strategy and Research, leading both Financial Strategy and Institutional Research for the University. Ian has also held various positions for nearly a decade in corporate finance, strategic planning, and business development at American Express, working in both its US and international businesses. Ian is originally from Belfast, Northern Ireland, he studied at Cambridge University in England, and has lived in London, Chicago, and currently splits his time between New York City and Boston. Ian is a self-confessed Science Fiction nerd, and loves biking, hiking, and travelling. We are excited to announce that Trevor Brown has joined New Profit as Partner, Personalized Learning Initiative. As leader of the new initiative, Trevor will ultimately serve as an advisor to four social entrepreneurs and organizations out of the 7-10 investments planned for the initiative, and he will also run the initiative's learning community. Trevor previously worked at the Monitor Group on on a wide range of growth strategy consulting projects, and also simultaneously oversaw Monitor's graduate, undergraduate, diversity, and experienced-hire recruiting strategy and operations for the U.S. When Trevor left Monitor, he joined Next Street to help build and lead their NYC advisory practice. At Next Street he was responsible for business acquisition, client relationship management, engagement execution, and hiring/talent development, and his portfolio was approximately 50% nonprofit organizations. He lives in Austin, Texas with his wife and three children.